After accompanying Charles Darwin as topographical artist on The Beagle in 1833-34, Conrad Martens settled in Sydney in 1835 and soon established himself as one of the most sought-after artists in the colony, fulfilling many commissions for watercolours of the landscape and harbour. This is one of four versions of this particular subject. 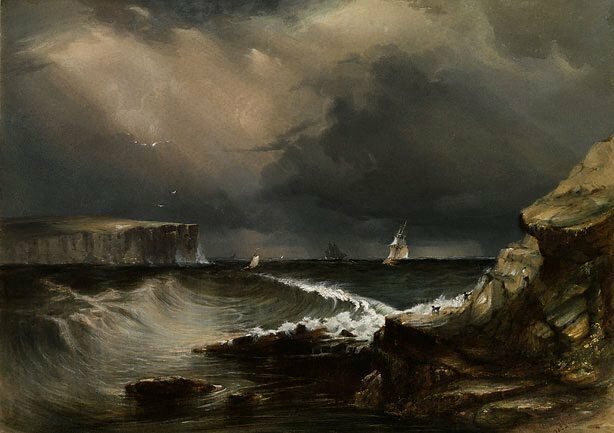 Another, dated 1854, is in the State Library of NSW (formerly in the collection of Sir William Dixson) together with a pencil study of North Head dated 6 March 1849. The Art Gallery of NSW version was painted for H Tobias. Martens admired the work of 17th-century French artist Claude Lorrain and the most famous British artist of his age, JMW Turner. Under their influence, he has accentuated the drama of the scene - rain clouds forming and a shaft of light falling on the foam of a breaking wave in a heaving sea. It is a boldly realised work with strong diagonals and contrasts of light and dark. This is one of a number of watercolours by Martens in the collection, one of which - ‘Apsley Falls’ 1874 - was the first Australian work acquired by the Gallery. Signed and dated l.r. corner, brown watercolour "C. Martens./ 1853".